Olajunwo Obasanjo pledges unflinching support to President Buhari. 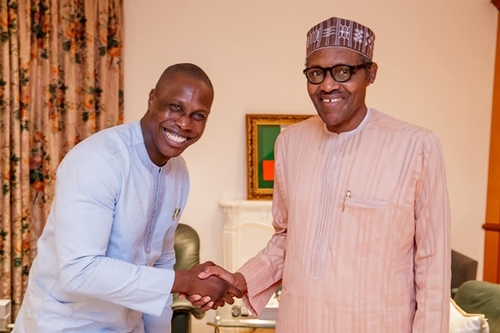 Former President Olusegun Obasanjo’s son, Olujonwo met President Muhammadu Buhari in Abuja and pledged to campaign for his re-election. The younger Obasanjo, son of Mrs Taiwo Obasanjo, has already identified with the campaign team. The 34 year-old only visited today to meet the President and pledge his support, contrary to the position of his father, who is vehemently against Buhari.